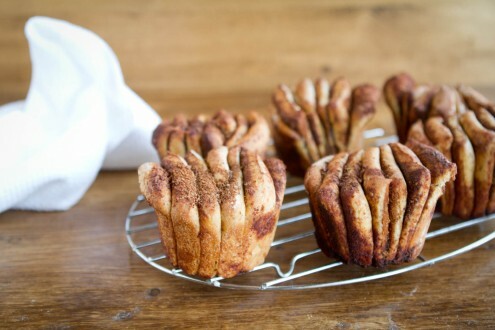 Cinnamon Pull-Apart Fantails | Naturally. Yet, I’m one step closer to graduation and now I have time to write a blog post! 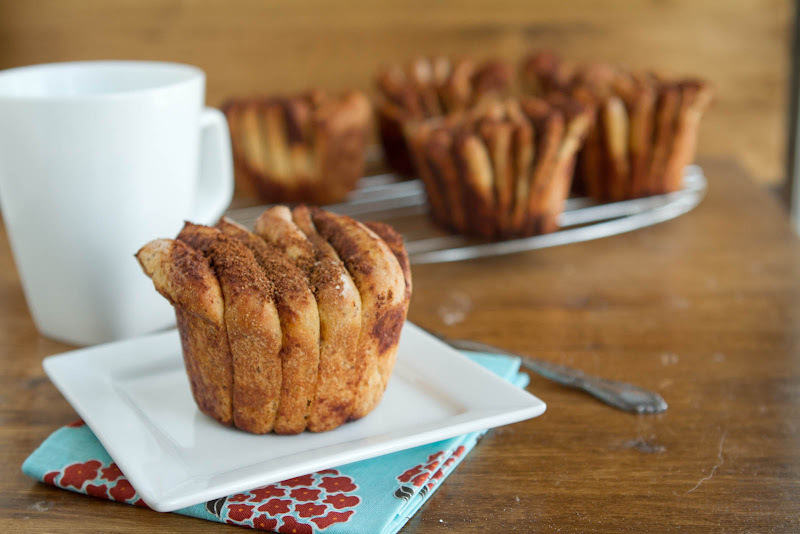 When I saw Joy the Baker’s Cinnamon Pull-Apart bread I drooled and drooled until I finally found enough time to make a version of it. After so much success with my vegan cinnamon rolls, I wanted to try make the pull-apart bread with Joy’s idea. I ended up making them from the ingredient list and had all intention of making it into the loaf until I realized my recipe was almost a whole cup short of flour but the dough was ready. So I went with it and let it rise all while trying to figure out how I was going bake this! I then remembered making fantail rolls for mother’s day and decided to merge everything together. 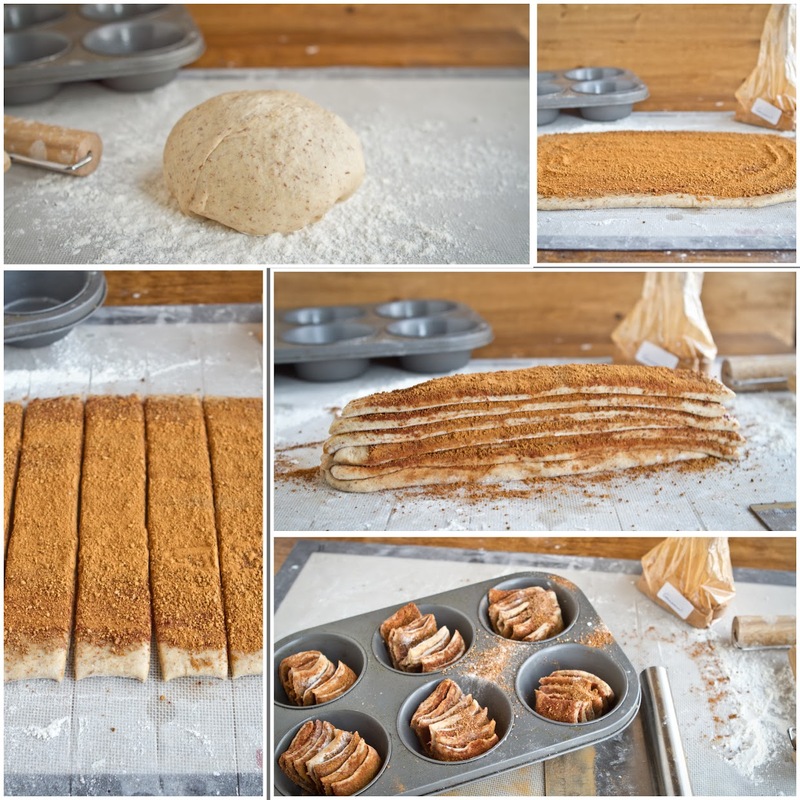 The end result was a cinnamon and sugar pull-aparts. I think I like these better than a cinnamon roll (and these taste great even without icing.) I’m not ashamed to say that I pretty much ate my way through this whole batch. In a stand mixer bowl, at milk, yeast, and sugar. Let sit for about five minutes or until yeast activates. Add in oil, flax seed mixture, salt, and the wheat flour. Give a good stir with a spoon and then turn on the mixer with the dough hook. Begin adding the all-purpose flour 1/4 cup at a time, letting it mix in before adding more. You want your dough to be soft (but not sticky) and the key to that is adding just enough flour so that it pulls away from the sides of the bowl but may still slightly stick to the bottom and letting it knead for 5-8 minutes. Once the dough is here, scoop out of the bowl, form into a ball, place back in the bowl, brush it with a oil, and let it sit in a warm, draft free spot for 1- 1 1/2 hours. Turn the dough out onto a floured surface and roll out into a 8 by 12 rectangle. Brush oil over surface and sprinkle with sucanat and cinnamon. Cut the dough into 6 strips (cutting the shorter of the length-it’s easier to handle.) Stack the strips on top of each other and cutting downward, cut 6 pieces for jumbo muffin tins or 8-10 for regular size muffin tins. 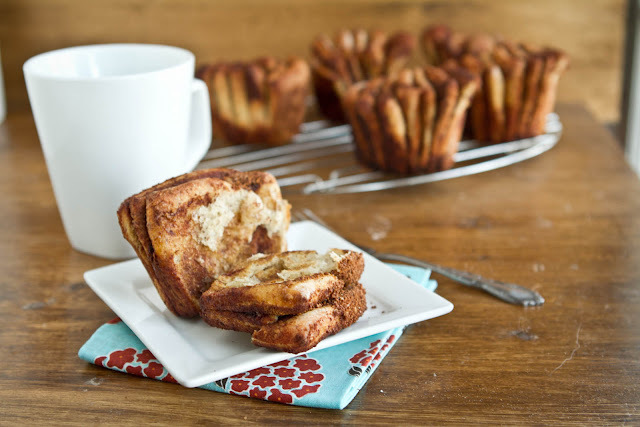 Brush muffin tins with oil and place each piece in the tin. Cover and let rise again. After about a half hour of rising, pre-heat your oven to 350˚. Once rolls have risen and oven is up to temperature, bake for 15-20 minutes. Fantails should be firm to the touch and golden brown. Remove from oven and eat warm! You can also add your favorite icing but these were delicious even without the extra sugar! To make non-vegan, use 2 eggs, 2 tablespoons of butter, and regular milk! I have a really hard time writing as well. Typing has taken over the world that’s for sure. I remember always having trouble with cursive writing (is that even taught anymore?) and then taking typing classes and having to blindfold ourselves. Ha! Anyways, the rolls looks SO good. I’ll be making those in about a week for a meeting of mine. With pecans. I made a version of these last year with lemon. I love your muffin tin version. They are just so striking and fun to serve. Thanks Anna! Now the waiting game begins on finding out if I passed all of them! What a brilliant idea! Will be giving your recipe a try.. Thanks for sharing! 80 pages… I think my hand would fall off! Writing thank you notes from our wedding is when I realized I never write anymore LOL owww! My brain’s mush too =( exams stink! I’ve been eyeing the same recipe, and now I have to make it!! It looks so delicious! EIGHTY pages? you’re crazy, and awesome! Ha- yeah I know! Now I’m hoping I pass them all so I don’t have to write them again! Where do I find almond oil?? ummm…wow. this recipe looks awesome (and completely delicious)! thanks for sharing. I do NOT envy you…but congratulations on being one stop closer to graduation! It’s great that you have treats like these to help get you through. These look DELISH! these look super delicious. for the non – vegan version you say to use 2 eggs. instead of what,if i may ask? 🙂 best from berlin! Could this be done in a crockpot? Would you still cut into smaller bits? Hi Daniela, I don’t own a crockpot so I have no idea- sorry I can’t be of any help!